”In this voice you can find everything: Lyric, Bel canto – Coloratura, Italian, French, German or Slavic Zwischenfach…” like this is praised the young Kosovarian Opera singer Flaka Goranci from the ”Neue Merker” critic in Vienna. Flaka Goranci set out studying piano, before changing her major to singing. She obtained her bachelor’s degree at the Music Academy of Tirana in Albania. Master studies followed at ”Buchmann-Mehta-School of Music” – Tel aviv University in Israel. As 22 years old she made her debut as Rosina in “Il Barbiere di Siviglia”, at the Albanian State Opera in Tirana. In Israel, Albania and Austria she appeared also in roles including Cherubino in Mozart’s “Le nozze di Figaro”, Dorabella in “Cosi fan tutte”, Dido in “Dido and Aeneas”, Ida in “Gemma di Vergy” and Die Mutter in “Der Jasager”, K.Weill. With opera directors such Uwe Eric Laufenberg, Stephen Lawless, Carlos Wagner, Niv Hoffman, Andrea Zogg, Ulrich Schulz, Dani Ehrlich, Nikolin Gurakuqi and Michal Grover Friedlander. She is a winner of the Hilde Zadek Scholarship Foundation (KS Hilde Zadek). Also, she was chosen from the international American regisseur Ellen Stewart of LaMaMa Theatre etc…in New-York, to perform the leading roles in the Premiere operatic theatre pieces of Il Corvo, Diana and Aesclepius performed in “La Biennale di Venecia”, in Italy, in Albania and Kosovo. In 2015 her first CD-Project ”Albanian Flowers” with the ensemble “Dielli” (Vienna Philharmonic musicians) was released by Gramola company in Vienna. In 2016 she gave her debut asOlga in “Eugene Onegin” – Tchaikovsky in Alden Biesen summerfestival in Belgium. In 2017 she performed the role of Carmen (adaptation) in Magdeburg Theater, Germany where she also performed the role of Dritte Elfe in Dvorak’s Opera ”Rusalka”. In 2018 she will be performing the role of Carmen in the new production of ”Carmen” opera of G. Bizet, in Obersaxen ”Opera Viva” festival in Switzerland. At Tiroler Festspiele Erl 2018 – 2019 season she was engaged for the first time with two roles, Teresa in ”La Sonnambula” V. Bellini and Ernestina in ”Loccasione fa il ladro” G. Rossini. 2019 Flaka will give her double debut at Ostrava Theater in Czech Republic with the role of Amelia in ”Un ballo in maschera”, G. Verdi. 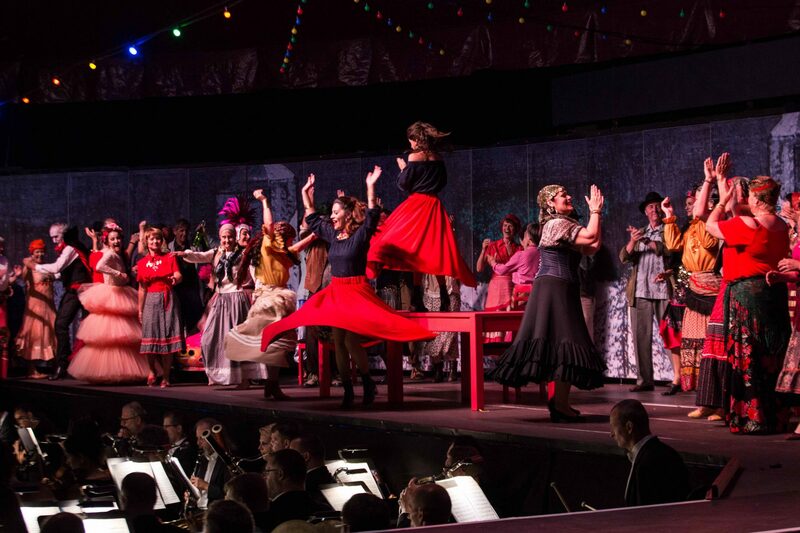 On 2020 she returns with Carmen ”Carmen” G. Bizet in the festival ”Gartenoper Langenthal” in Switzerland.